The Nature Conservancy is hosting a Volunteer Recruitment Day at our Hauser Nature Center located at 1567 Long Pond Road, Long Pond, PA (Monroe County) on Saturday, March 30th from 10:00 a.m. – 12:00 p.m. More information and online registration is provided on our website at https://www.nature.org/en-us/get-involved/how-to-help/volunteer-and-attend-events/find-local-events-and-opportunities/volunteer-recruitment-event/. The Atlantic Broadband phones are in, and working great. Our new number is 570-215-0204. 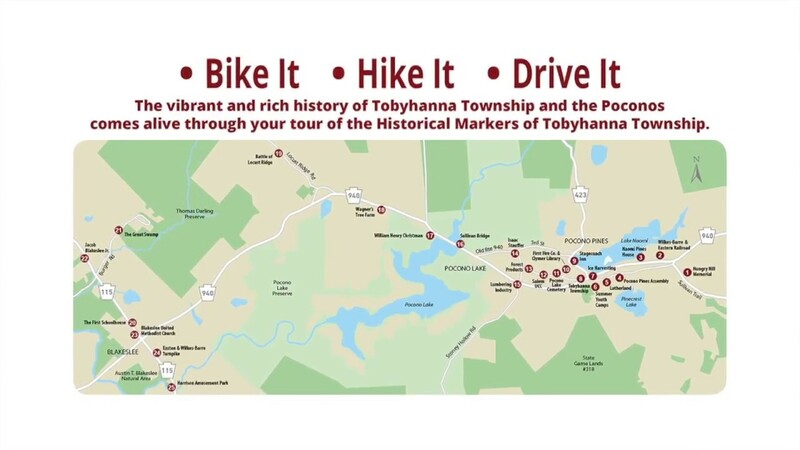 This video is about MATT MARKER DISCOVERY inviting you to explore the northeast Pocono Mountains in Tobyhanna Township. An odyssey through history examining what transpired in the development of northeast Pennsylvania, specifically Tobyhanna Township and the surrounding area. Obituaries published in The Journal-Herald and The Journal of the Pocono Plateau will now also be posted to the Obituary page on this website. Because the papers are not published daily, some obituaries may appear first on the web, so people can be informed about calling hours and service details. Know the dangers. Safe drivers need eyesight and reflexes that are up to the demands of driving, and sometimes have to make snap decisions. When debris blows onto the road or someone makes an unexpected turn, the difference between a close call and a total disaster is often less than two seconds. Age only makes vision and reaction time worse, which is why 80-year-old drivers get into just as many accidents as 18-year-old drivers, according to a study by Consumer Reports. Look for warning signs. Fortunately, it’s easy to spot many of the signs that it’s time to quit driving. When a driver becomes easily distracted, has trouble maintaining the correct lane, has significantly impaired vision, tends to drive too fast or too slow, or starts hitting curbs frequently, these are warning signs that shouldn’t be ignored. If you don’t spend much time in the car with your loved one, the signs you’re looking for might be minor scrapes or dents appearing in the car or garage. Be Thoughtful of the Life Change. Giving up driving can lead to emotional, physical, and practical concerns about how to get around. Seniors are already at-risk for isolation and depression, and making it more difficult to get around can only worsen outcomes. Nobody wants to feel like they’re imposing on their family or friends, especially not every time they want to go out on a whim. Services like Lyft or Uber can help provide safe transportation on demand. And in-home caregivers can sometimes provide transportation. Rely on Judgement, Not the Law. Most states don’t require older drivers to undergo additional testing, and legal authorities are generally powerless to strip someone of their right to drive until they’ve actually done harm. That means families have to work out these issues for themselves. Telling someone it’s time to hang up their keys is a tough topic to broach, but ignoring the signs it’s time to quit is a mistake many people don’t live to regret. For more information, visit www.griswoldhomecare.com or call 570-338-4060. A dementia or Alzheimer’s diagnosis doesn’t necessarily mean the end of all travel, but it does mean taking extra precautions and making extra preparations in order to ensure a safe and enjoyable experience for all. For those seniors who are able, travel is part of a healthy balanced lifestyle in preventing and slowing the onset of dementia. Travel may simply be impossible for some, including those with Stage 6 or 7 Alzheimer’s. Signs that travel is impracticable include high fall risk, unstable medical conditions, severe mood swings, or agitation and aggression. Before you embark on the trip, evaluate whether travel is right for your loved one. Look for ways to simplify travel, such as taking direct flights, avoiding unfamiliar modes of transportation, and keeping surroundings familiar to the largest extent possible. It’s also a good idea to cap total travel time to four hours. Unfamiliar circumstances can give rise to mood swings, fear, and anxiety. For example, if your loved one has never ridden a subway, it’s best to avoid that situation now. If they have an object that brings familiarity to them, make sure you have it while traveling. Daytime travel is often easier for seniors living with dementia, as it illuminates surroundings and allows for increased visibility. This, in turn, makes surroundings feel more familiar. Many seniors also have problems seeing and reading signs at night, which can increase the likelihood of wandering. Before you begin traveling, write out a note card with your loved one’s name and information and the name of the hotel or address where they will be staying. Place this card in their purse or pocket. It may be useful if they wander off or become lost. Pack a bag with the essentials, including legal documents like identification cards and passports, a fresh change of clothes, itinerary, prescriptions and medical information, food allergies, and emergency contacts. Keep this bag close by at all times, whether in the car or on a plane. Of the 8,000-plus heat-related deaths reported annually in the United States, 36 percent are among those age 65 and older, according to a Centers for Disease Control Heat-Related Illness Survey. Hospitalizations for heat-related symptoms increase for those over 85. Perform an air conditioner check. Air conditioning is the top protection against heat-related illness. If the home isn’t air conditioned, buy a room unit or encourage your loved one to go to a public place during the hottest hours of the day, like a library or senior center. Avoid dehydration. Non-alcoholic beverages will replace the body’s salts and minerals released from sweating. Put a glass of water in every room, and encourage sipping from them throughout the day. Frequently drinking small amounts is the best way to stay hydrated. Check your loved one’s urine; light yellow means they’re getting enough to drink; darker yellow means they’re not. Other symptoms include very dry skin, dizziness, rapid heartbeat or rapid breathing. Know the signs of heat exhaustion. Too much heat can cause heat exhaustion or, even worse, heat stroke. Heat exhaustion happens when you become dehydrated and your body is unable to replace the fluid and electrolytes it has lost. The signs of heat exhaustion include heavy sweating, nausea, and feeling light-headed and faint. If body temperature continues to rise, it can result in heatstroke, a serious medical condition. Signs of heatstroke include fainting, a body temperature above 104° F, confusion, flushed skin, irritability, and acting delirious. If you’re around someone with signs of heat exhaustion, call 911. Harrisburg, PA – The Pennsylvania Department of Transportation (PennDOT) today launched a video to assist Pennsylvanians in navigating roundabouts. The video instructs viewers how to use both single and multi-lane roundabouts whether in a vehicle, on a bicycle or on foot. The video can be accessed by visiting the roundabout page on www.penndot.gov or by visiting the department’s YouTube channel. A modern roundabout is a type of circular intersection where traffic flows continuously in a counterclockwise direction around a central island and where the entry traffic must yield to the circulating traffic. The Federal Highway Administration (FHWA) encourages implementing roundabouts as they have been proven to significantly improve safety and reduce traffic delays over traditional stop- or signal-controlled intersections. In tandem with the FHWA’s recommendation, the Pennsylvania State Transportation Innovation Council (STIC) has prioritized implementing roundabouts as alternatives to traditional intersections when possible. Crash rates and severity of at least three years of data from before and after installation for the state’s first 10 modern roundabouts built at previous traditional stop-sign or signal-controlled intersections showed that fatal crashes were eliminated (two to zero) and major-injury crashes were also eliminated (four to zero). Additionally, moderate-injury crashes were reduced by 71 percent (seven to two) and minor-injury crashes by 25 percent (16 to 12) as well as the total number of crashes which dropped by 16 percent (63 to 53). National studies have shown that modern roundabouts reduce fatal crashes by up to 90 percent and result in a 75 percent reduction in injury-causing crashes. Modern roundabouts also improve pedestrian safety by allowing people to cross shorter distances with slower moving one-way traffic. Modern roundabouts have been being built in the United States for less than 30 years and in Pennsylvania for less than 15 years. In Pennsylvania, there are currently 32 completed roundabouts, 20 under construction and at least 10 more expected to go to construction over the next two years. To learn more about roundabouts, visit www.penndot.gov and enter “roundabouts” in the search bar. Set your bookmark right now, because this is a website you'll want to return to regularly. We will be posting news, pictures, last minute stories, events listings and much more to keep you informed about what's happening in and around our western edge of the Pocono Plateau. Watch for PDF postings of The Journal-Herald, The Journal of the Pocono Plateau, and The Journal of Penn-Kidder.